I have just complete another Free Form Bargello composition. This time the design is based on circles. For this I used an old fashioned compass. The centre is a complete circle, while the rest is made up of part circles. The combination of green and magenta is quite bold. Here is the finished piece. The predominant colour is green in various shades. The other colour is shades of magenta. The surround is in two shades of white, combined, with a bit of green to tie in with the main colour. All the threads are Paternayan Persian wool. The circle patterns were stitched using all three strands of the wool, while the surround was stitched with only two strands, one of each of the two shades of white. I used two strands as an attempt to make the central area stand out a bit more. The fabric is an 11ct white interlock canvass. This composition, like the previous one is part of my ongoing aim to use up my stash of Paternayan wool. 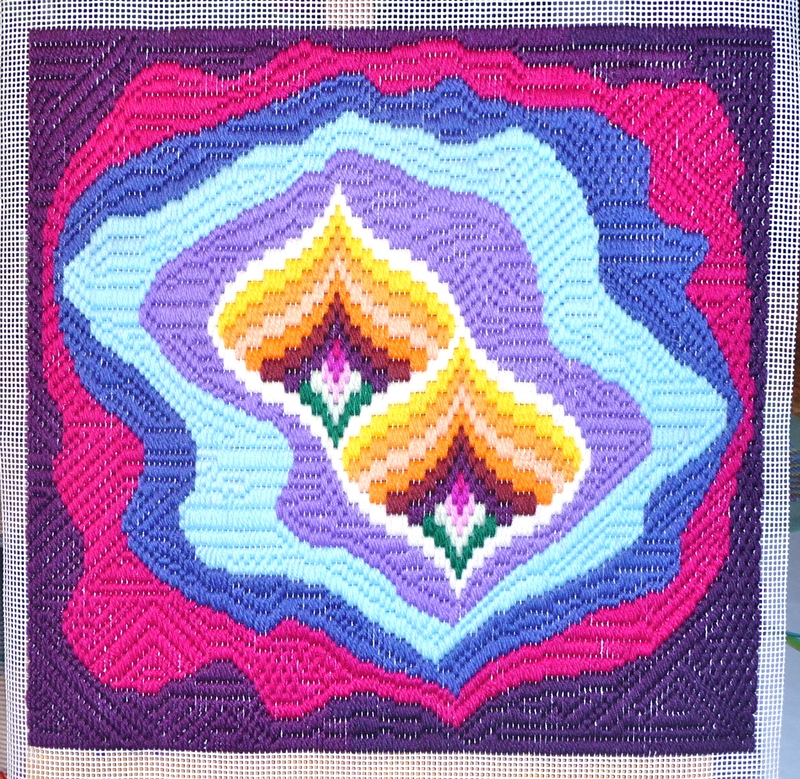 Still have some left, so at least one more Free Form Bargello may be on the horizon. I seem to have got caught in a rose garden at the moment. 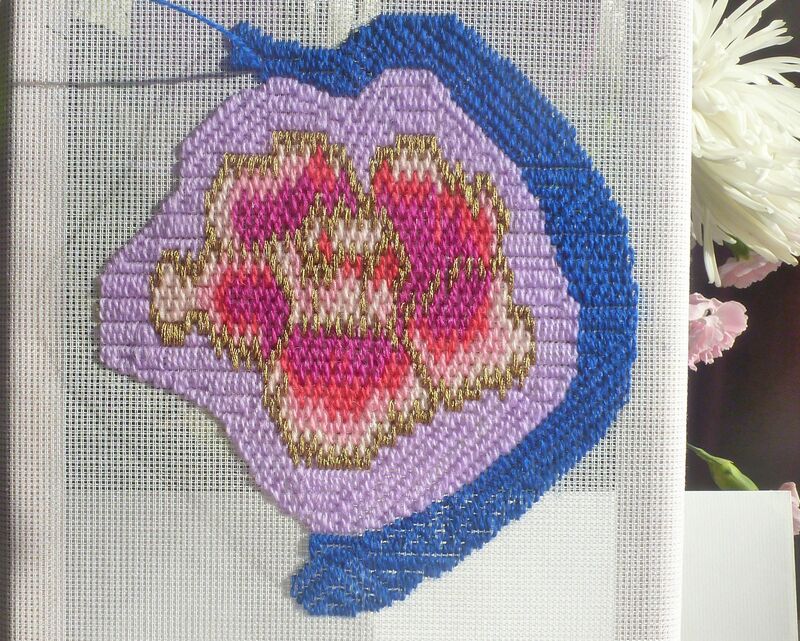 My current stitching project includes another rose. Though this time it is all in Bargello needlepoint. The design for the rose comes from Pauline Fischer’s and Anabel Lasker’s book Bargello Magic. I haven’t used all of their design, just the main flower. I have kept to their colour scheme, but without the greens. There are three shades of Hot Pink and one shade of Fuchsia in the rose, which is surrounded by metallic gold. The rest of the piece will consist of irregular shaped concentric rings. Each will be filled with one colour – three in lavenders and two in ice blues. There is no pattern as such for these rings. 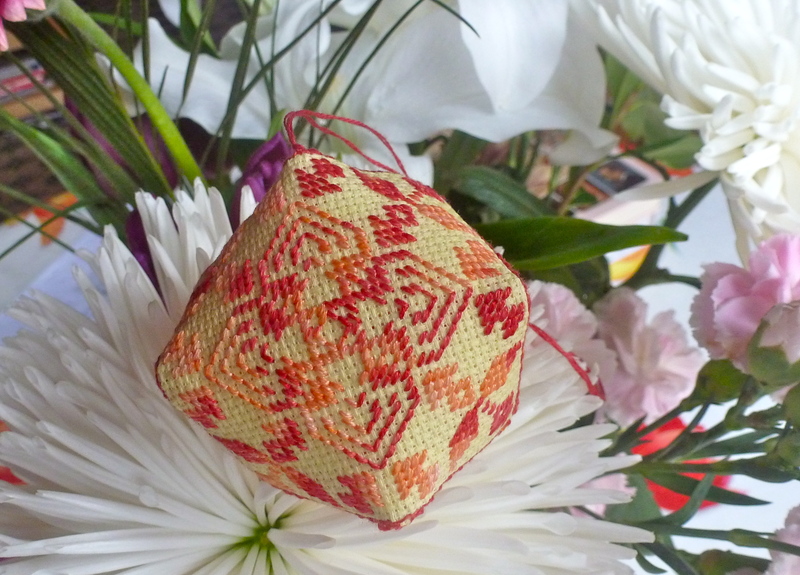 You just make it up as you go along – a sort of Free-Form Bargello. I got the idea for this from a book of that title by Gigs Stevens. A bit of a change from a wholly designed pattern. For this piece I am using Paternayan wool. The fabric is a 14ct canvas and I use a single strand of the wool. The only problem is that a single strand is sometimes a bit too thin for the fabric. It almost works, but I feel there is too much of the background visible. Two strands would be too thick. I could use a 16ct fabric, but I don’t think I can get this in canvas and I do like the extra stiffness of canvas. Anyway below is a photo of where I am just now with the rose piece. Three and a half rings to go. It is followed by a photo of my first free-form bargello project. 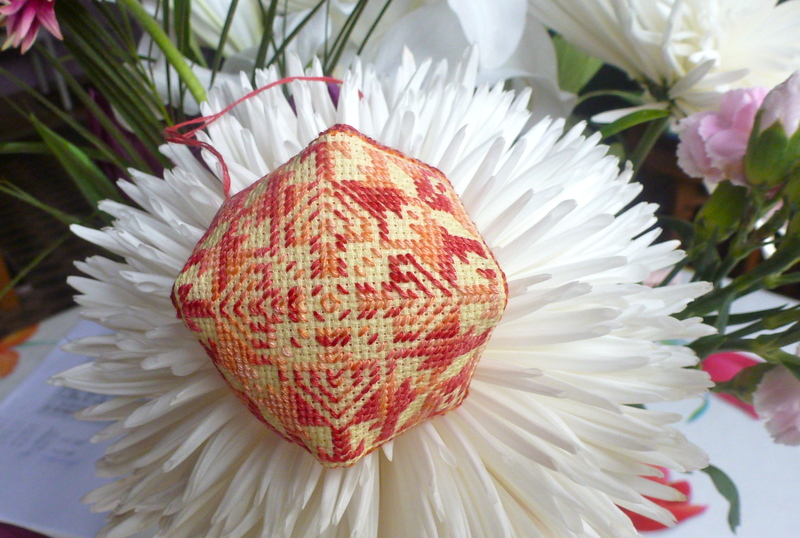 This has two pomegranates in the centre and was stitched with a thicker wool – Anchor’s tapestry wool. Just before starting on the Rose in a blue garden, I made another little biscornu. As usual one of Louison’s lovely designs. This one is No. 166 and I stitched it with a thread from Les Fils du Rhin – Bourrasque. The fabric is a 18ct Aida in yellow. Here are the two sides of the finished biscornu. Happy stitching everyone.